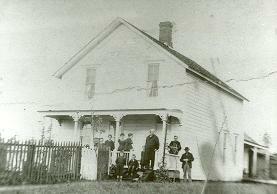 Welcome to the Oak Lodge History Detectives Website! Our April meeting will be an important meeting. We are calling it a "Special Meeting" in that our current bylaws specify that amendments to the bylaws can be voted on at a "Special Meeting" called for by the chair. The OLHD board has voted to move forward with OLHD becoming a 501(c)3 tax exempt non-profit organization. Updating and clarifying our bylaws is a first step in that endeavor. As such we will be combining our regular April meeting with a "Special Meeting" for this purpose. We'll also update our members with the latest history-related local activities, preservation legislation, and upcoming events that we might want to participate in. This meeting will also provide an opportunity for individuals to renew their membership with OLHD. Individuals need to be up to date with their membership in order to vote at this meeting. Our OLHD Membership Chair maintains a database for this purpose, and those memberships that have expired should have received a reminder notice recently. I'm attaching our Nov. 2018 OLHD Minutes for your review. Please take a moment to look them over prior to our Feb. 14th meeting. This month we'll be catching up on history-related Oak Lodge news, learning about historic Clackamas County schools from Richard Craven of the Clackamas County Family History Society, and seeing some of the newest additions to our digital archives from the Naef family. Join us on Feb. 14th as we continue to investigate and preserve Oak Lodge history.